"Well, we knew the boys were gonna be a bit more grown up on this album, but the worry was, just how much?! Fortunately they've brought a new quality and a lot more feeling without ditching their pop roots, and it's a perfect combination. The album starts with the first three singles, and moves onto the next single And I - a huge, soaring affair with Ronan sounding not unlike Wet Wet Wet's Marti Pellow, but in a good way! it's probably the best thing they've ever done and the whole album is a cerdit to their four years in the business. Other highlights include Ro and Steve sharing the vocals on Will Be Yours - and li'l Mikey's very own song, Good Conversation. All in all, a magnificent treat. Welcome back!" "By now, the 'Zone are dab hands at this album lark. On this, their third effort, you won't find fillers, just quality tracks from one to 17 (yeah, 17!). Almost all of the tunes would make top singles, but our personal highlight is the two-part slowie I'm Learning. No major surprises, but if it's beautifully crafted pop balladry you're after, you won't find better." "After an unfeasably long wait , it's finally here and it's fab! The new album, the boys' third, is their strongest so far. 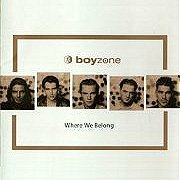 The accomplished, intelligent pop songs featured on Where We Belong have an emotional depth that elevates Boyzone above all their rivals. From the perfect pop of "Picture of you" to the superb "One Kiss At A Time", Ronan has captured the perfect balance between complex lyricism and passionate emotion. And he sounds better than ever! Even the two tracks penned by little Stephen are rip-roaring stormers, with catchy choruses and killer hooks. At the end of the day however, this is Ronan's album and the beautiful "This is where I belong" is his finest hour. Check out these lyrics, "Here I stand in the Northern rain, and I can't believe I'm home again, I can't believe nothing's changed, I'm finding my way". Ronan's songwriting belies his tender age. At 21 he is showing that he is following in that fine tradition of Irish songwriters. MASSIVE! Says: Boyzone have grown up without growing old. A perfect pop album. BUY IT!"